The Saturday, January 28, performance at the Grand of "Oberto" turned out to be an afternoon of thrilling opera. "Turned out to be" because an un-staged version of Verdi's very first, and almost never performed opera would not necessarily inspire great anticipation. Aida or Traviata anytime, or even Verdi's first hit Nabucco, but Oberto is just not on the radar. At age 26 Verdi must have felt the need to fulfill expectations for what popular opera was supposed to be, and indeed there is quite a bit of music that sounds like that famous opera composer of the preceding generation, Donizetti. But when the overture begins with a trumpet duet, and then later an aria is accompanied with cascading arpeggios from the bassoon, the listener discerns Verdi's originality in orchestration, so appreciated by opera players- I was one of these myself for many years. There are important roles, too, for trombones and tuba, not always heard in 1939 when Oberto was premiered. So why was Oberto so successful yesterday? Wonderful performers! the cast, conductor, chorus, and orchestra. 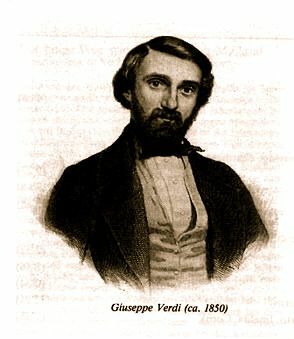 Credit is also due to the co-producers, OperaDelaware and Philadelphia's renowned opera training school, the Academy of Vocal Arts for conceiving of this unique collaboration, a highly satisfying approach to Verdi's neglected first opera. For this concert version, the cast was in formal attire rather than costumes, the large-by-opera-standards orchestra right behind them on stage, the modern convenience of supertitles added much (English with the singing in Italian), and there was also the minimal though complete staging, i.e. acted-out interactions among the five main characters which made for clear story-telling. The excellent chorus was a combination of OperaDelaware's own, along side AVA students. They entered and exited as the story required, standing behind the second violins. The four large roles and one smaller one were sung by the greatly talented AVA artists-in-training who already possess big mature voices, with the intensity of fine acting to match. When the curtain calls arrived, it seemed that soprano Michelle Johnson had truly captured the hearts of her listeners, due in part to the conflicted and pathetic vulnerability of her character, Leonora, who, prior to the events depicted, had been seduced and then abandoned by the tenor, Riccardo. The mezzo, Cuniza, is now his fiancee, but becomes Leonora's greatest advocate, via opera's penchant for the absurd yet dramatic. Leonora's father Oberto, the baritone, chooses his passion for revenge rather than entering a briefly open doorway to offering forgiveness, while Cuniza's servant Imelda, played by mezzo Sasha Hashemipour had some beautiful lines to sing, though a bystander to the overblown preoccupations of her employer's circle. Michelle Johnson possesses a voice of rich timbre which retains its focus and color in the highest register. Verdi's daring two-octave descents revealed an exceptionally strong and expressive low range as well- she has it all. The huge voice of Margaret Mezzacapa who played Cuniza was equally gripping, and her acting matched Johnson's intensity. It was only her character's role as an intermediary among the other principals which limited her effect on the audience. Musa Ngqungwana as Leonora's father Oberto was a strong baritone, whose character starts out wounded, searching for relief. But when his vengeful passion, ultimately leading to his own death, finds its full flower, Ngqungwana gripped the listeners with the force of his character's emotion. Tenor William Davenport, who was having his only shot at performing the role which was rotating through 3 tenors in 4 performances, came off powerfully as Riccardo, a confused young man, first swayed by romance, then by an advantageous betrothal, and tragically by the challenge to duel Oberto, a much older man whom he knew he would in effect murder. Davenport has a Pavaratti-like timbre, as well as many of the affects of an Italian opera tenor. He was a convincing bad-guy, while perhaps not quite convincing us that such a character is as human as the rest of us, not an easy task in many a 19th century opera role. Another advantage afforded by the concert format was a clear view of conductor Christofer Macatsoris, who is also the general music director for AVA. Without cover of the usual orchestra pit, we could see the drama in his every gesture, the way his baton goes from hand to hand, his expressive fingers and wrists doing much of the work. His involvement with the singers is constant, also finding occasion to cajole lines ascending from the depths of the 'cello section. Macatsoris tensile strength might seem his most prominent feature, still he delights in the airy gestures of the bel canto style. His orchestra of Philadelphia professionals, some of whom are also OperaDelaware regulars, was highly disciplined, responding securely to their demanding maestro. Veteran clarinetist Joseph Smith was particularly expressive, as was flutist David DiGiacobbe, while all the sections maintained uniformly high standards. An opera in two acts, Oberto's intensity rose as each act drew to its close, and it was then, as emotions reached fever pitch, that all the power and imagination of Verdi's nascent talent showed through. One performance remains, January 31 at the Haverford School's Centennial Hall.